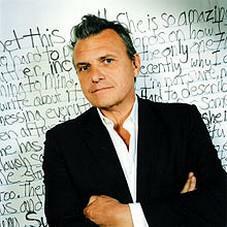 Jean-Charles de Castelbajac, also known as JC/DC, born in Casablanca, Morocco, is a fashion designer. He has enjoyed international success with some of his creations, including a coat of teddy bears worn by pop star Madonna and by supermodel Helena Christensen in the film Prêt-à-Porter. As well as his imaginative clothing collections the designer creates home furnishings and has designed a watch inspired by the childhood favorite, Lego.